It is fall in New York and the change of colors on the leaves heralds the wine auction season. A time when those with too much money get to spend it lavishly on wines most of us will never get to taste just so they can rub it our faces. Ahhhh, autumn. 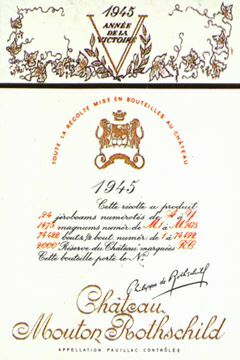 As wine spectator so aptly reported earlier in the week, records are being shattered all around and unfortunately for my favorite wine the 1945 Chateau Mouton-Rothschild. (Like I could afford even a single bottle) Chrisites LA Auction sold a case of the juice for $290,000 followed by 6 mags for $345,000 shattering the previous case record by $175,000. I bet that breaks the wine budget for the year. The good news is that Sotheby's NY Auction, to be held on October 21, will all so feature a case of the Victory label. Now I am not aware as to the provenance of the Christie's bottles, but Sotheby's has acquired a case and then some from the untouched Mahler-Besse cellars. All too often the '45 Mouton has been reconditioned (albeit most auction botles come from the famed Nicolas Cellars) but Sotheby's case was acquired by Mahler-Besse in 1946 or 1947 and has been cellared by them ever since-- a deal at an estimated $120,000 to $200,000. I fear, however, that we will be up against some stiff competition as it was reported that 5 buyers were in play for the Chrisitie's case as prices rose up to $150,000 and a final two battled it out. Now, I would bet there are some sore egos with fat wallets dripping at the chance to snag these bottles for a relative song compared to their Christie's couterparts, so to you all I say good luck. I think it takes a while for the bank to approve a second mortage so I would get on that. In all seriousness, those that are attending the auctions would do well to wait out the crowds and bid on lots at the end of the auction when most of the crowd has thinned. Look for "off " vintages and odd lots from your favorites or look for known but non-marquee producers from good vintages that you may want to try. A quick browse of the catalog and I can spot a number of good deals laying in wait at the end of auction. But remember when you get caught up in the bidding that you are going to pay a 19.5% buyer's premium on top of the hammer along with a 1% insurance charge and any sales tax due (on the total not the hammer.) Good luck to you all.